I would like to lie and say that this was a photograph I took this very morning to catch the moment when the poet was told that he had won the T.S. 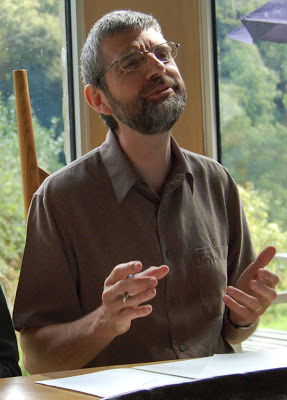 Eliot Prize for Poetry for 2009 but, apart from fear of my nose growing long, the scene of Summertime outside the window makes the idea not entirely convincing! 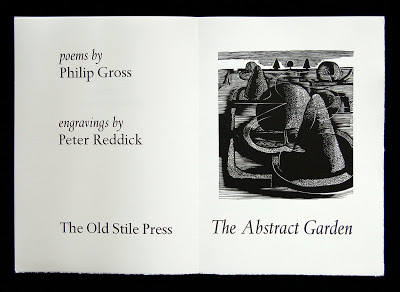 Rather, the photograph was taken at an earlier moment of rejoicing for us, namely when Philip Gross and Peter Reddick sat down together to sign the copies of The Abstract Garden which I had finished printing a short time before. 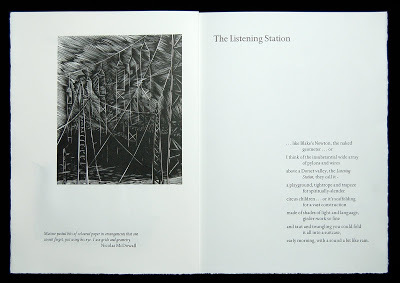 To remind our friends of this book, here is a photograph of the Titlepage and just one of the page openings each of which consists of a poem, a wood engraving and their careful position together on the page. More can be found out about this this book (one of our greatest favourites, I have to say) by clicking on this link. But the excitement of this day is, of course, is Philip’s triumphant winning of the T.S.Eliot Prize for his book The Water Table, published by Bloodaxe. 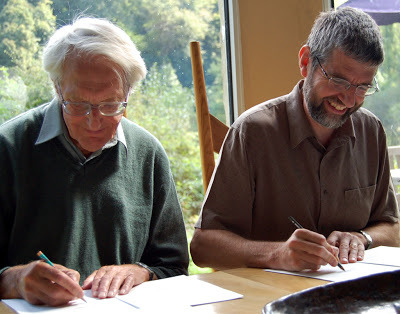 The judges of this year’s Prize, Chair Simon Armitage, and fellow-poets Penelope Shuttle and Colette Bryce, reached their decision after months of deliberation and debate. The winner was chosen from a field of ten highly-regarded poets. I checked on the link to the press website. What a wonderful book this is. Classic Old Stile Press, full of enticing lay-outs and ravishing images. Congratulations to all concerned. A great addition to the O.S.P catalogue.